The long-awaited mod for Minecraft Pocket Edition 0.12/0.13, which adds to the game more than 50 new creatures! Tigers, elephants, lions, parrots, horses, turtles and even aquarium fish. And this is only part of what I have described. Currently mod does not work in multiplayer with your friends. 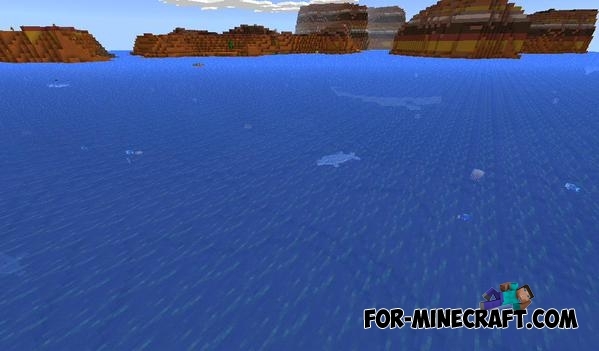 This mod, that was created using ModPE and do not need to say that mobs make sounds like a cows or other creature. If you want to do better? Learn C ++ and create a much better addon. There are friendly and hostile mobs, which can kill you. Mod also adds a lot of new items and armor, but we do not have recipes. You can add the spawn eggs by using Simple Commands Mod. Enter the command in chat: / give <id object> <1> <1>. Turtles: They like sugar cane. Horses: You can tame wheat or apples, and depending on their type is their speed and jump level. You can craft Horses Armors, including the new Emerald Armor! Ostriches: Males are aggressive, passive females, and if the strike will give you eggs, which you can use to get your own ostrich. Lions and Tigers: You can tame little one with meat, but not the big ones. Whales: They have a lot of life, but if you manage to kill one of them, will give you a lot of fish and some random items. Seals and Penguins: They like to swim!